Try growing astilbe for beautiful, showy flowers that do well in a shady garden bed. This perennial has feathery flowers that sit above the fern like foliage in a majestic way. These tips will show you how to grow astilbe and bring color to your shady perennial garden beds. Most shady garden beds are filled with ferns and hostas. While these plants are lovely in themselves, it’s still nice to have a plant which will actually flower well in very little direct sun. Astilbe is one of those plants. My mother had a lovely garden set up until she died. Once she retired and had time to spend in the garden, she became an expert at making them really beautiful. Most of her beds were in full sun but she had a long raised planter along one side of her house that was in part shade most of the day. To give a pop of color in this shady spot she chose to grow astilbe. And grow well, they did! I loved seeing their pretty blooms every time I walked by the garden spot. I visited her a few years ago and she gave me some divisions of astilbe to bring back to North Carolina for my garden (she lived in Maine.) They survived the trip back and are growing well and increasing in size each year. Astilbe is easy to grow, and is very tough and hardy. 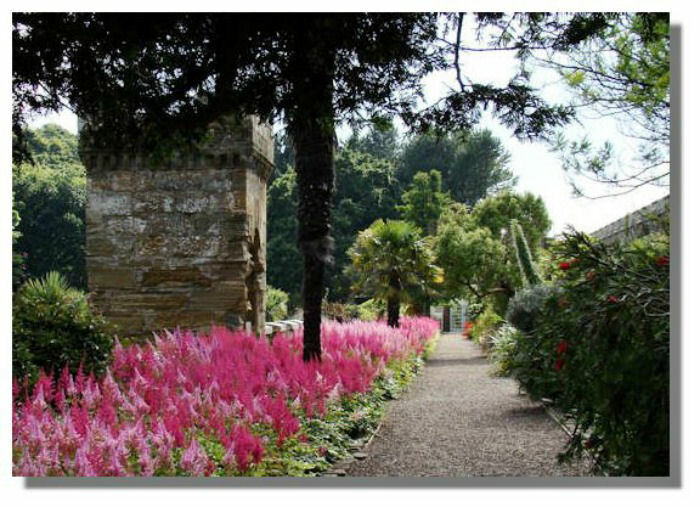 One of the beauties of them is that they do equally well in part sun or partial shade and will flower in either location. They prefer shade to look best. Astilbe growing conditions are mainly focused on making sure that the plant gets enough water and not too much sunlight. Here are some general growing tips. 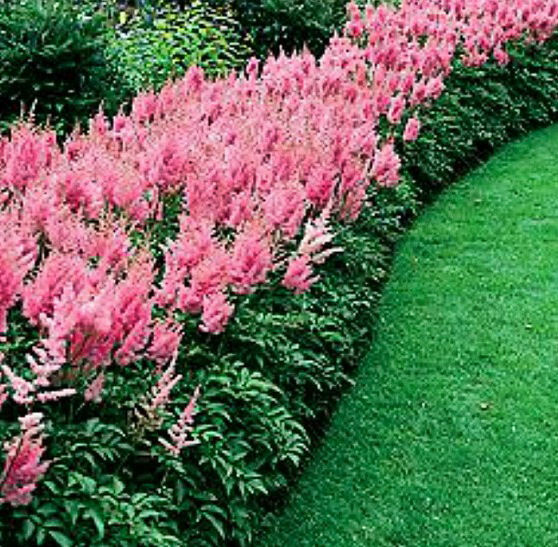 Planting astilbe is best done in a bed that is either in half sun/half shade or in full shade with just filtered light. I have mine growing in garden beds that are facing north and they get a bit of late afternoon sun. This seems to suit them beautifully. 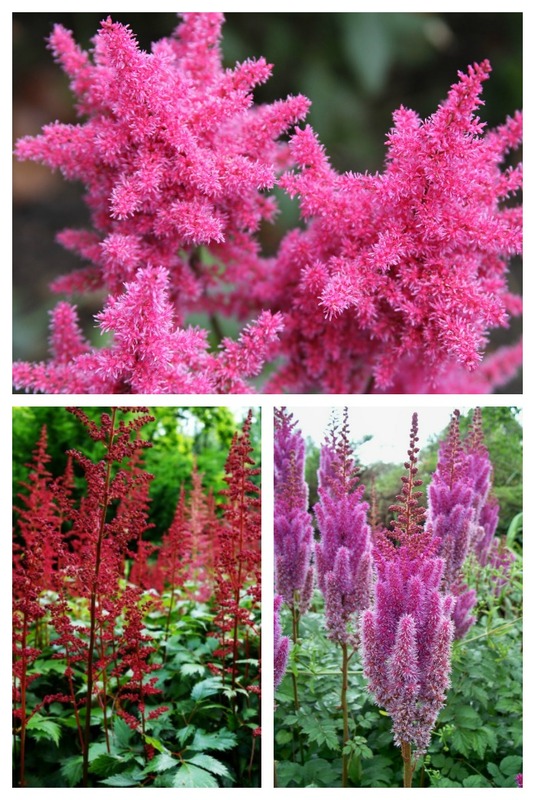 The most commonly grown astilbe have flowers that are in the red/pink variety with colors ranging from dusty pink through to vibrant pinks and reds. 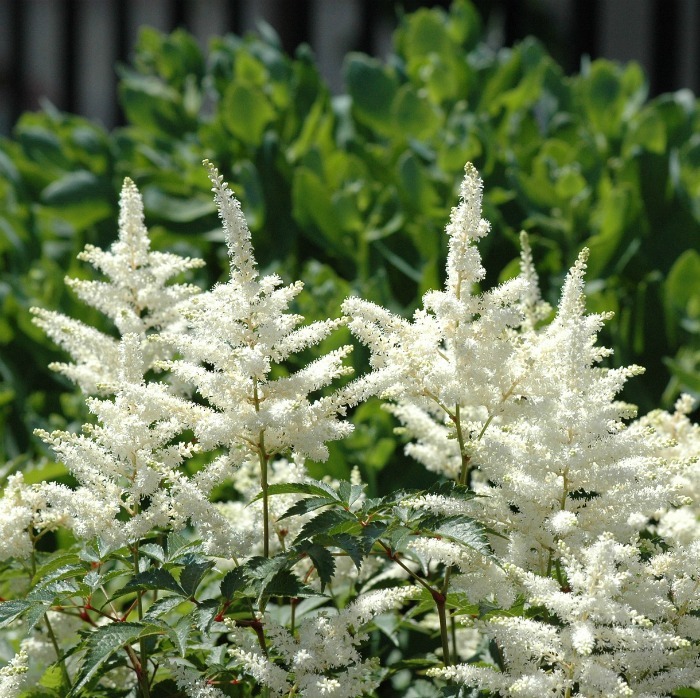 Some varieties of astilbe are also pale tan or even white. 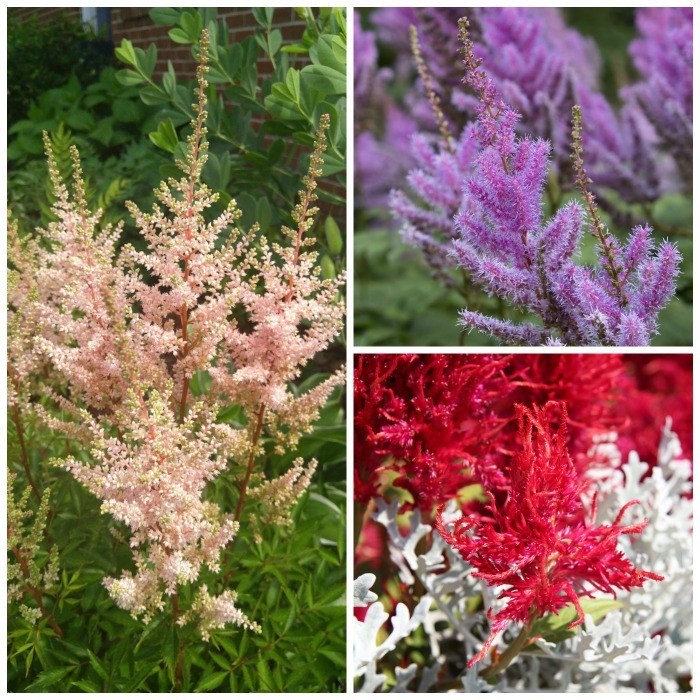 Check out this post for some great images of astilbe colors. Some astilbe flowers are fine and feathery and others have the goats beard flower shape and texture that is much firmer and more plump. How large does astilbe grow? Most will grow to about 36″ tall with the flower stalk and about 2 feet wide. But there are also varieties that will grow to 5 feet so be sure to choose one suited to the space you have. You can plant astilbe fairly closely together if you want a cluster like look. For individual plants space them 1-3 feet apart depending on the variety. 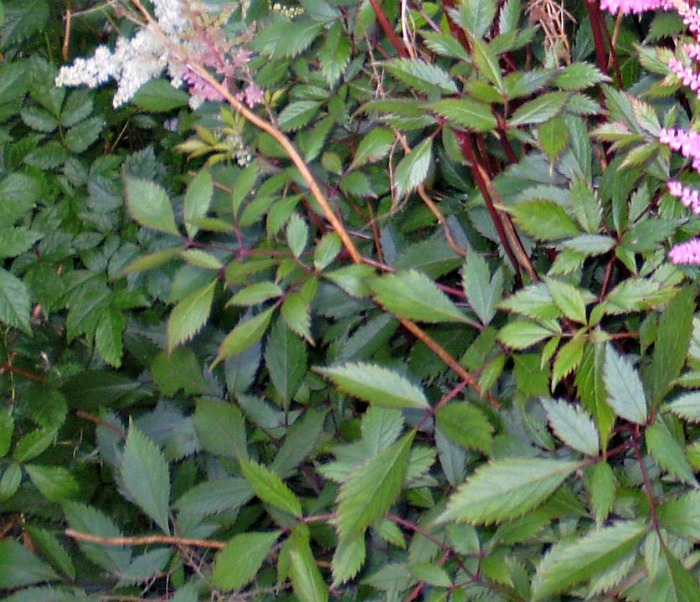 When does False spirea bloom? The leafy green party of the plant grows steadily all spring and then about mid to late summer it is astilbe bloom time, when the long flower plumes will open up above the plant. Plants grown completely in the shade will not give quite as good a display of flowers but dappled shade will give a good flower show. Leaving the spent blooms in place through the fall encourages birds to feed which is always nice to see in a garden. Eventually the flowers will dry. I leave my seed heads right into the winter for the birds and then just trim them up in early spring. When choosing Companion plants for goats beard perennial, select perennials and bulbs that have similar growing habits. Once you find a spot where one will do well, they all benefit. Ferns, and hostas are good choices, as are many other shade loving plants such as coral bells. See my list of good companion plants for Astilbe. Growing astilbe from seed is possible but this can be a challenge. The normal way to propagate astilbe is from root divisions. Astilbe will send out more and more plants as it matures. Dividing astilbe is just a matter of digging up the plant and separating some of the smaller babies to get more plants for free. They take quite easily as is evidenced by mine in their two day car ride in the middle of summer. Advisable to plant in the early spring or fall. Divide astilbe every two to three years. If you have a plant that was originally placed in the wrong part of the garden, you can move it to another spot where it will get the best light conditions. Transplanting astilbe is best done in the early spring or fall months when the temperatures are cooler. Astilbe likes moist soil so hotter climates will need to have them in shade and you’ll need to add extra water. They grow best in Northern areas where it is cool and wet. While astilbe does like moist soil conditions, it does not like wet feet, so be sure not to let the water puddle at the crown and root areas. Astilbe leaves are very smooth and glossy and they contrast nicely with the feathery flower plumes. The edges of the leaves have serrated margins. Some astilbe varieties are evergreen but many die back in the fall and go dormant until spring time. Organic matter in the soil is beneficial. You can also use a slow release fertilizer twice a year. Astilbe is not not too particular about the type of soil. 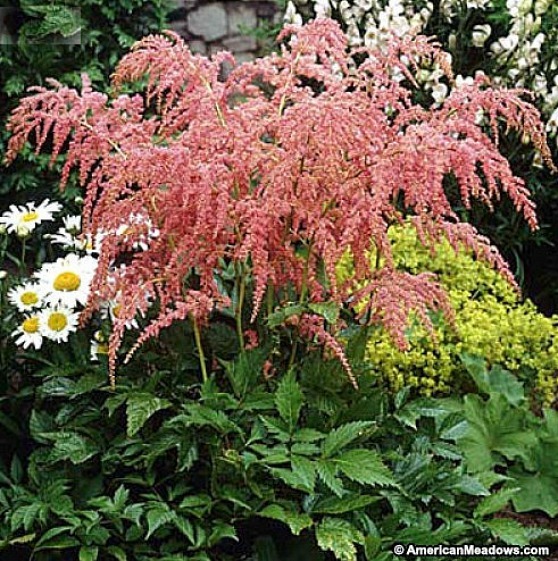 Astilbe will grow in soils that are loamy, soils with heavy clay content or even moist and slightly wet soil. 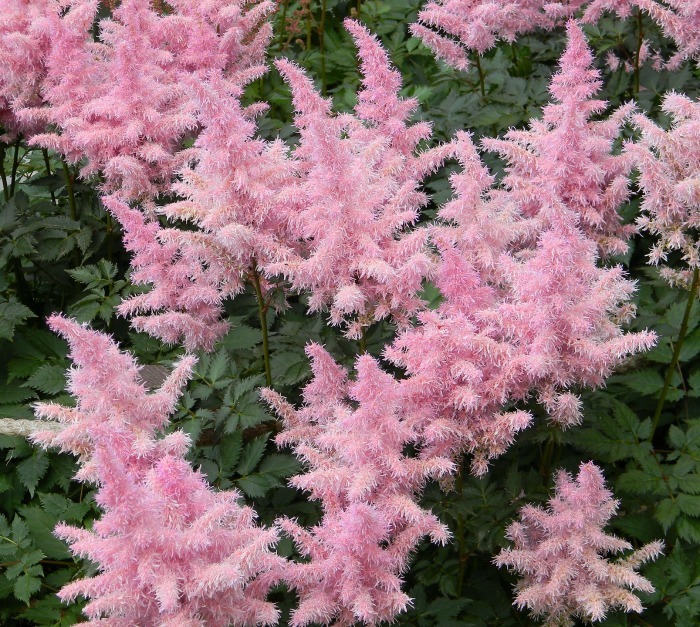 An acid soil is desirable but astilbe will grow in soil with a pH of 6.0 – 8.0. Be sure the soil drains well. How cold Hardy is Astilbe? Astilbe overwinters in zones 3-9. They don’t do as well in either extreme cold or heat zones. Because of its mounting habit, astilbe looks great when planted in groups. The flowers are good for a cutting garden and the plant is deer resistant and they attract butterflies. Astilbe make great choices for garden beds under a canopy of trees. Can astilbe be grown in containers? It is easy to grow astilbe in pots and plants grown in containers may be the perfect choice for you is you have a semi shady patio or deck that needs a splash of bright color. Astilbe can be planted alone in a container or mixed with other shade tolerant annuals and perennials. Be sure the container is in a shady spot and water it regularly to make sure the soil does not dry out. Image shared from Rampant Scotland. Be sure to try growing Astilbe if you want a spectacular looking along a border edge as long as the bed that gets plenty of shade during the day. This unusually colored astilbe is called Straussenfeder Astilbe. It’s sold by American Meadows and is great for mass plantings. Have you grown astilbe? What zone are you in? Please let us know in the comments below. Admin note: This post first appeared in April of 2014. I have updated the post to add additional information, new photos and a video for you to enjoy. Would you like a reminder of this post for growing astilbe? Just pin this image to one of your gardening boards on Pinterest so that you can easily find it later. Astilbe is also known as false spirea and Goat's beard. It is a shade loving perennial plant that will flower even in full shade. Flower Color: White, peach, tan and all shades of red and pink. Features: Great for Cut flowers and deer resistant. Astilbe will flower best if it gets at least some sunlight. However, I have plants in a north facing border that gets very little sun and it will still give flowers. 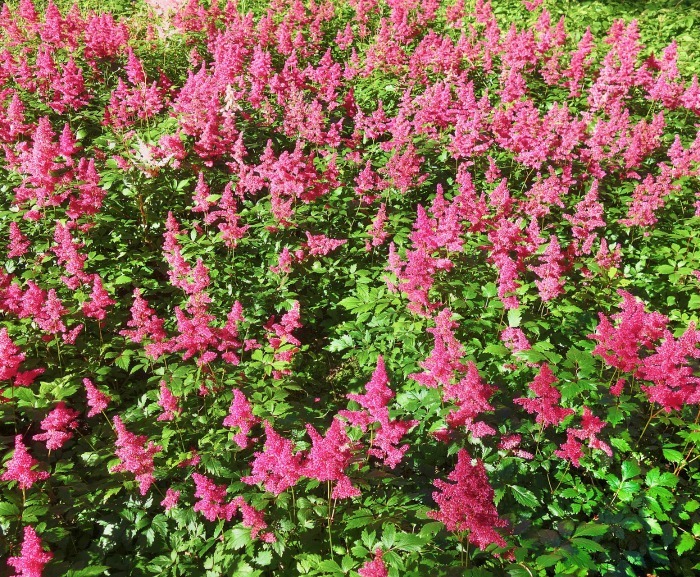 Grows well with Hostas, ferns, coral bells and other shade loving plants. Hi! I found your site through pinterest looking for shade plants! These are lovely, but now that I live in New Orleans, I think they’re out. *Sad* I just wanted to comment because of two things. 1) I love the Gaia avi. Hehe. 2) I grew up in Raleigh so I thought that was neat too! Hi Zel, Yes it is harder to grow astilbe in the hotter regions. I have to very shady areas here so they work pretty well….they don’t get much direct sun at all. Hi, the Astilbe drew my attention. It is so pretty, but I’m gathering it is not an annual. I moved into an apt. with a patio and a small space for growing flowers. I’m trying to think of what to plant. I want something bright, annuals of course. I get part shade, part sun. Last year I put in Impatiens, petunias and mums. Do you have any ideas? Thank you. HI Marilyn. I do actually grow perennials in tubs as well. But when I choose annuals, I normally pick something tall like a dracena to give height to the planter and then fill in with things like begonias, petunias, vinca, ivy, etc. A lot depends on how much shade you get. If it is too much, many of the annuals won’t do very well, but if you have grown pentunias you should be okay with pretty much any annual from the garden centers. Another favorite of mine is caladiums! This year, I am going to try and do more perennials in my tubs. I’m kind of tired of having to do them over each year, and my perennials will come back for me in tubs in zone 7b. The astilbe are gorgeous. Sadly, the astilbe I’ve planted have failed to thrive. Every year, they come back, but look scraggier and scraggier. I live in zone 4, so I’m wondering if I should move them to a sunnier spot to see how they do. Thanks for a helpful post on what seems like a little appreciated plant in the Midwest! Hi Rikke. You could try. Last year, I planted a slightly shady part of what used to be my vegetable garden. It gets afternoon sun but shade in the morning. It is HUGE this year and so healthy, so they can take some sun as long as it is not all day long. Let me know how you go! These are beautiful! I am getting married on August 29th this year and was thinking about planting this so I can cut some for the wedding (just in little vases here and there… nothing major in case it doesn’t work). When would you suggest planting them? And any idea how long they survive once cut? Thank you so much. Hi Claire. I plant Astilbe in the spring, but it takes several years for plants to get the size of these. I’ve never cut the flowers so I am not sure how long they would last in vases. I do put butterfly bush flowers (similar texture and size) in water and they last for several days. Hi Trish, yes you can divide the plant in the spring or fall. This makes for a healthy plant and encourages good growth. However it is not a good idea to divide before you have grown them for three years. In my experience, they need a few years to flesh out the original plant. If you divide them when they are too young, it will weaken them. shhhhhh on the rabbits. LOL Mine ate my beans right down to the ground the other day. Astilbe is still going strong for the time being. Sorry to hear about your critters! I have had mixed luck with them. Most of mine are in the shade but my best one is in full sun in a south facing garden. It’s a mystery, since they are supposed to love shade. It could be lack of water. They don’t like to be wet but they definitely like more water than some shade plants. Astilbe is prone to a couple of fungal diseases which if left untreated can kill the plant. Powdery mildew one and leaf spot is another fungal disease that affects astilbe. Are you giving it plenty of water? If it is not in full shade, the sun can really amp up the moisture needs for it. I live in the upstate of SC and have been looking for really nice perennials to grow beside the house, which gets both shade and good sun. These Astilbe look amazing! Can they grow in charleston in shade if they get constant water . Hi Darcy. I live in NC and it gets pretty hot here and I don’t have to water them all the time. In fact, my established ones rarely get additional water. I’m not sure if SC would require extra watering. It depends on whether you get much rain. Here in NC, we get showers later in the afternoon quite often. I have had Astilbes growing in a shaded garden for many years and have pretty much, unfortunately, ignored them. I just happened on to your How to Grow Perfect Astilbes on Pinterest and it has inspired me to give them some TLC this fall! I think I will dig and divide them and give some or all of them new spaces in which to grow! Thanks for providing incentive that I needed. I totally disagree that Astilbe’s will grown in the hot afternoon sun. Hi Rozella. I agree with you in normal circumstances. They prefer shade. But I do have one growing in the full sun here in NC and it flowered all summer last year. We will see how it does this year! I am new in growing this plant. Would it be to hot to grow in Waco, Texas. They would be planted on the northeast corner of our home in partial sun in the AM and shade in the afternoon. Is it worth a try? Great timing for running across this post! I bought some Astilbe but haven’t got them planted yet, and didn’t know anything about them. I been wanting some for a while. The package says to plant in full sun, but I have found out that lots of plants that says full sun doesn’t like the Texas sun. I wanted to plant some in the shade up along the fence, but wasn’t sure if they would do very good. Thanks for the tips! I live in zone 4 in Kansas. I had three astilbes and one made it after three years and I realized the difference was the water and the partial shade. I have the white astilbe with my hostas and coral bells and it is beautiful every year but it does require extra water or it starts to look dead. The other two plants were in more direct sunlight and did not receive enough water and they completely died. So my advise is extra water and shade! This is going to be my first year to try growing astilbes in my shade garden. Wish me luck because they are so beautiful. I like all of your comments and recommendations. Best of luck with them Becky. I’d love to see some photos when they flower! I love these flowers. Mine bloom but not all summer. Have them in the shade with bleeding hearts. They seem to be crowded could this be the reason they didn’t continue to bloom? When do I want to thin both plants out? Having a problem with all my phlox plants this year . All the leaves have a white powdery substance covering them. Will they bloom or should I cut them all back. Hi Marilyn. Is it just the flowers or the plants that are turning brown? Astilbe need plenty of moisture or they will suffer. Too much sunlight can also be a big problem for them. My astilbe start out pink but turn brown as the flowers fade. Could it just be that which is happening? Hi Carol. Will these Astilbe grow and thrive in zone 5b? Chicago area. I am a novice gardener. Thx! What will they look like in winter? Does the Astilbe attract butterflies and/or hummingbirds? I grow Astilbes in the Charlrston area we are zone eight and it is really hot I have my astilbes in pots on my deck they get some sun but I am water them religiously just about every day to keep them hydrated they love the water and I don’t don’t seem to mind the heat as long as they’re get plenty of water. 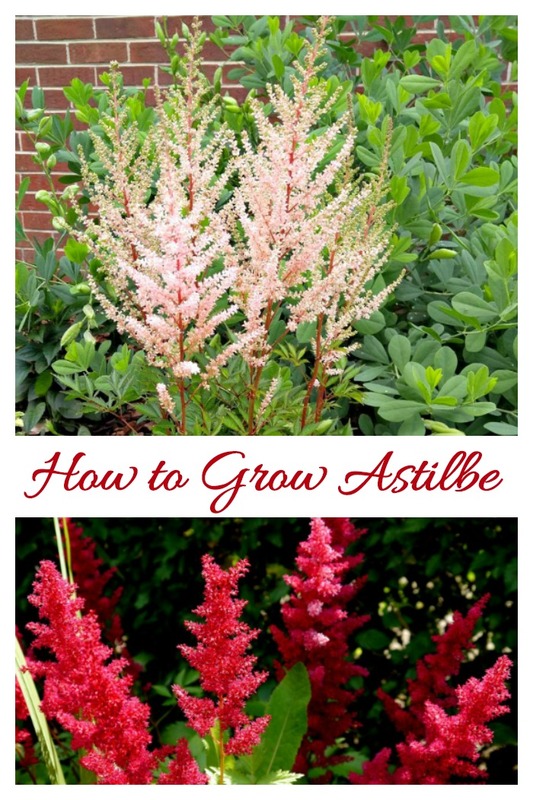 Thanks for the tips on how to grow astilbe. I had some in a pot for many years, and it didn’t bloom very well this year. After reading your article, I took it out of the pot and tickled apart many divisions that had formed. I planted these in a dappled shade area of my yard, and hope for a return to lovely plumes of pink blooms next summer. I appreciate all your advice! Hi Carol. I have astilbe in a shady spot which gets some sun. I have this plant for several years but all I get are vines, no flowers. I have vines all over. What is the problem. 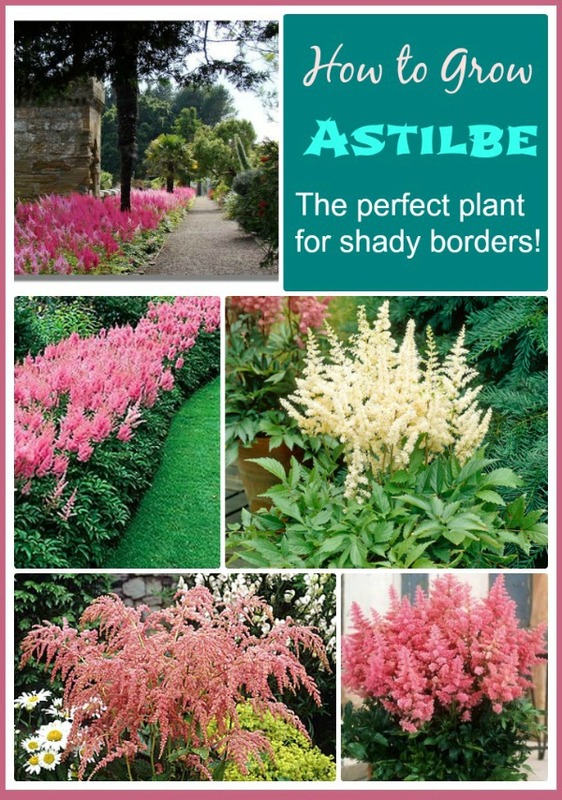 Can u plant Astilbe in South Africa? I bought an Astilbe root (in a bag) from HD. Planted it in a shady part of my front yard Houston, Tx. Kept it watered. Never saw anything shoot up. We don’t have deer or rabbit problems here, so don’t have a clue what happened. My azeleas and coleus are doing great in same area.